Proteolysis is one of the posttranslational modifications of the six IGFBP´s. It results in fragments with no or reduced affinity to IGF-I and IGF-II and results in increased availability of IGF´s to target cells (1). In contrast to other IGFBP´s no IGF independent functions of the IGFBP-4 fragments have been found until today. IGFBP-4 is proteolysed by Cathepsin D (2), Plasmin, MMP´s, and PAPP-A (5,6) as the major IGFBP-4 protease. IGFBP-4 proteolysis is strongly increased by IGF´s in a low concentration, with IGF-II being the more potent activator. PAPP-A seems to be an important regulator of IGF bioavailability. PAPP-A activities. IGFBP-4 proteolysis by PAPP-A is inhibited by proMBP and heparin-binding domains of IGFBP-3 (6), IGFBP-5 and CTGF. This process may play a role in follicular development (7) and regulation of cell growth in a broad range of cell types (8-13). Moreover elevated levels of IGFBP-4 fragments have been discussed as biomarkers for risk assesment of major adverse cardiac events in patients presenting with ischemia (14). 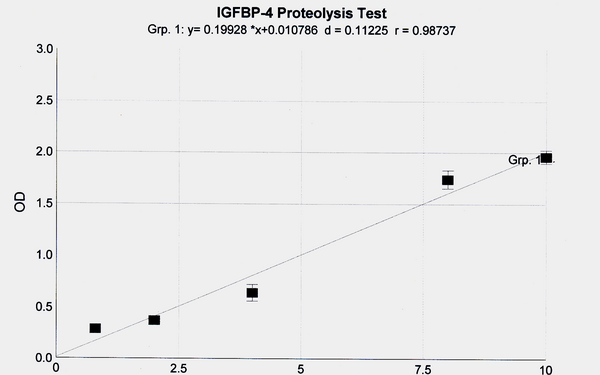 The test uses biotinylated IGFBP-4 as a substrate for proteases. The proteolysed Biotin-IGFBP-4 is bound to the wells of a microtiterplate. Unproteolysed IGFBP-4 is detected by a monoclonal antibody to human IGFBP-4 followed by a goat-anti-mouse-peroxidase-conjugate. 3. Antibody: 25 µg anti-human IGFBP-4, mouse monoclonal, lyophilized. 5. Assay Buffer, buffered solution for dilution of proteolyzed samples and dilution of Conjugate. 50 ml. Ready for-use. 7. Substrate, TMB, 11 ml. Ready for use. 8. Stop Solution, 0,2 M sulfuric acid 11 ml. Ready for use. Caution: caustic. The ibt direct IGFBP-4 proteolysis kit is for in-vitro use only! The assay buffer contains BSA. Though serum is not considered as a high risk material for BSE, the assay buffer should be treated as potentially infectious. The stop solution contain acids that is caustic. Avoid contact with skin, eyes and mucous membranes. 7.1.2 Dissolve Biotin-IGFBP-4 with 100 µl distilled or demineralized water or buffer suitable for proteolysis to yield a 25 µg/ml solution. Mix carefully and allow keep at room temperature for at least 30 minutes to ensure complete dissolution. The Biotin-IGFBP-4 is stable for one week at 4 °C. Reconstituted Biotin-IGFBP-4 may be frozen in aliquots and is stable for at least one month. 7.1.3 Reconstitute the Antibody with 25 µl of distilled or demineralized water to yield a 1 mg/ml stock solution. The stock solution is stable for at least one month at 4°C. Prepare the required quantity of working solution by dilution of 1 volume of the stock solution with 1000 volumes of Assay Buffer, e.g. 2 µl antibody plus 2 ml Assay Buffer. 7.1.5 Prepare the required amount of conjugate working solution by diluting the conjugate 1 + 2000 (e.g. 2 µl Conjugate plus 4 ml Assybuffer). Use the same day. Proteolyse suitable aliquots of biotinylated IGFBP-4 in the presence and/or absence of IGF´s. After proteolysis stop with suitable protease inhibitors. Dilute samples to fit into the standard curve. As an example we have tested degradation of biotinylated IGFBP-4 with plasmin in the absence of IGF´s.. For proteolysis, we incubated 0.5 µg of biotinylated IGFBP-4 with 10 µg, 5 µg, 1.25 µg 0.25 mg and 0 mg (as control) in a total volume of 40 µl Tris-HCl pH 7.5 for 30 min at 37 °C. The reaction was stopped adding 10 µl of a stock solution of a protease inhibitor cocktail (1 Complete Mini tablet, Roche Applied Science, in 1.5 ml water). An aliquot was diluted to 10 ng/ml to fit in the range of the standard curve and the concentrations of the nondigested IGFBP-4 was measured. The concentrations of the plasmin digested samples are found in the range of 5.31 ng/ml to 7.16 ng/ml, corresponding to a degradation of biotinylated IGFBP-4 from 46,9 to 28.4 %. The concentration in the control was calculated as 10.9 ng/ml, corresponding to a recovery rate of 109 %. 7.3.1 Dispense 100 µl of assay buffer per well as blank value. Dispense 100 µl per well of each standard or sample in duplicates into the wells of the microtiter plate. Note: these should be dispensed within a period of 10 minutes to minimise drift. Incubate for 30 minutes to 1 hour at room temperature (18-25° C). Manual wash: Decant the contents of the wells by inverting sharply. Dispense 250 µl of diluted wash buffer to all wells. Decant and repeat twice. Tap the inverted plate firmly on absorbent tissue to ensure complete removal of washing buffer before proceeding to the next step. 7.3.3 Add 100 µl of the diluted antibody solution to each well and incubate for 1 hour at room temperature. 7.3.4 Wash all wells three times with working wash solution as described in 7.3.2. 7.3.5 Add 100 µl of the conjugate working solution to each well and incubate for 1 hour at room temperature. 7.3.6 Wash all wells three times with working wash solution as described in 7.3.2. 7.3.7 Add 100 µl of substrate to each well of the microtiter plate. To minimize imprecision, this should be done by a multichannel pipette or in timed intervals. Incubate for 30 minutes at room temperature. 7.3.8 Stop reaction by adding 100 µl of stop solution to each well. To minimize imprecision, this should be done by a multichannel pipette or in timed intervals as in step 5. The blue colour will turn yellow upon addition of the stop solution. 7.3.9 Measure the absorbance of each well at 450 nm (reference 650 nm). Dissolution of lyophilized reagents – it is essential to dissolve the lyophilized reagents completely! Washing – Insufficient washing (especially incomplete removal of reagents and washing buffer) can result in high coefficients of variationhigh background, and poor results. Use of a shaker - may increase sensitivity and decrease variation of duplicates. To be performed. However we know, that the antibody works in western blot. 2.) Claussen et al. (1997): Proteolysis of Insulin-Like Growth Factors (IGF) and IGF Binding Proteins by Cathepsin D. Endocrinology Vol. 138, No. 9 3797-3803. 3.) Lawrence, J. B. (1999): The insulin-like growth factor (IGF)-dependent IGF binding protein-4 protease secreted by human fibroblasts is pregnancy-associated plasma protein-A. PNAS March 16, 1999 vol. 96 no. 6 3149-3153. 4.) Giudiceet al. (2002). Identification and Regulation of the IGFBP-4 Protease and Its Physiological Inhibitor in Human Trophoblasts and Endometrial Stroma: Evidence for Paracrine Regulation of IGF-II Bioavailability in the Placental Bed during Human Implantation. The Journal of Clinical Endocrinology & Metabolism 87(5):2359–2366. 5.) Gyrup, C.; Oxvig (2007): Quantitative Analysis of Insulin-like Growth Factor-Modulated Proteolysis of Insulin-like Growth Factor Binding Protein-4 and -5 by Pregnancy-Associated Plasma Protein-A. Biochemistry, 2007, 46 (7), pp 1972–1980. 7.) Spicer L. J. (2004): Proteolytic Degradation of Insulin-Like Growth Factor Binding Proteins by Ovarian Follicles: A Control Mechanism for Selection of Dominant Follicles. Biol Reprod 2003, 70, 1223–1230. 10.) Durham et al. (1994): The insulin-like growth factor-binding protein-4 (IGFBP-4)-IGFBP-4 protease system in normal human osteoblast-like cells: regulation by transforming growth factor-beta. J Clin Endocrinol Metab. 1994 Dec;79(6):1752-8. 12.) Smith et al. (2001IGF-Binding Protein-4 Expression and IGF-Binding Protein-4 Protease Activity Are Regulated Coordinately in Smooth Muscle During Postnatal Development and After Vascular Injury. Endocrinology Vol. 142, No. 10 4420-4427. 14.) Postnikov et al. : N-terminal and C-terminal fragments of IGFBP-4 as novel biomarkers for short-term risk assessment of major adverse cardiac events in patients presenting with ischemia.Clin Biochem. 2012 May;45(7-8):519-24. doi: 10.1016/j.clinbiochem.2011.12.030. Epub 2012 Jan 28.